Connected health is a new model for health management that leverages technology to deliver care outside of traditional health care settings. While the demands on health and social care services are increasing, notably because of a growing and ageing population, cost of medical treatments are rising whereas health and social budgets are more and more constrained. Despite some obstacles that yet need to be overcome (shared medical records, privacy, implementation of smart applications, etc.) the progress of Connected Health is facilitated by the proliferation of mobile devices in the population, and the increasing number of wearable devices that track biological data such as blood pressure, oximetry, spent calories, etc. Withings is a company that designs smart wearable devices such as activity trackers with bio-sensors, smart scales and sleep monitors. It is actively involved in the Connected Health endeavor and has notably founded the Health institute that conducts surveys and scientific studies to “accelerate the connected health revolution”. BCC research predicts that the market will reach $21.5 billions in 2018, with a five years (2013-2018) compound annual growth rate of 54.9%, making it one of the most attractive sectors of the IoT. 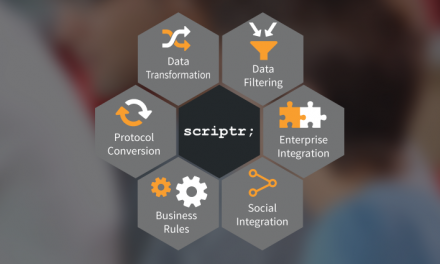 In line with what we wrote in our July post related to our fibit connector, we believe that connected health apps will heavily require back-end capabilities such as integration, orchestration, persistence and messaging, which are provided to you by scriptr.io. In addition to the aforementioned scripts, note that you need to checkout the Withings connector from Github into your scriptr.io Workspace. This script is called by front-end clients in order to subscribe a user to or unsubscribe him from the Blood Pressure notification sent by Withings. Clients should invoke this script passing the “action” (subscribe/unsubscribe) and “userid” (the user’s Withings id) parameters. First, let us require the withings/user module of our connector, since it is the one we mainly use to interact with Withings’ APIs. We also require the withings/common module of the connector that contains some useful constants. Last step is to test the value of the “action” variable in order to invoke the adequate method of the “NotificationManager” (“instancesubsribeToNotification” respectively “deleteSubscription”), specifying the notification type. That’s all. We now can subscribe to / unsubscribe from Withings notifications. The “healthMonitor” script contains the main logic of our app, as described earlier. It is the callback that is invoked by Withings upon notification. Note that a notification is sent by Withings to the callback whenever the user’s device is synchronized with his Withings account. It is up to the callback to retrieve updated data from Withings’ APIs, using the “startdate”, “enddate” and “userid” parameters sent by Withings. var startDate = getDate(7); // this is a utility function. you can find it in the app's source code. Since fat mass can result from lack of activity, we also implement a function that checks the user’s activity for the past seven days. This helps us in better identifying the reason behind the high blood pressure. message += "Consider having more intense physical activities." message = "Consider having more physical activities."